Sambhalpur in Orissa is where homegrown silks are dyed and woven to produce the region's signature sarees. Ikat is the style of weaving endemic to the region, which may have been in vogue in the western hills since the Middle Ages or even as recent as two centuries ago. It is virtually the hallmark of Orissa's handloom industry, and is characterised by dhadi (warp ikat at the borders) and muha (weft ikat in the endpiece). The Sambhalpuri silk you see on this page contains supplementary warp- and weft-work in addition to the bandha, and dyed the earthy colours - slate-green on the field, glimmering red and peach on the border and the endpiece, and pale browns and oranges - of the rural landscape of the state. 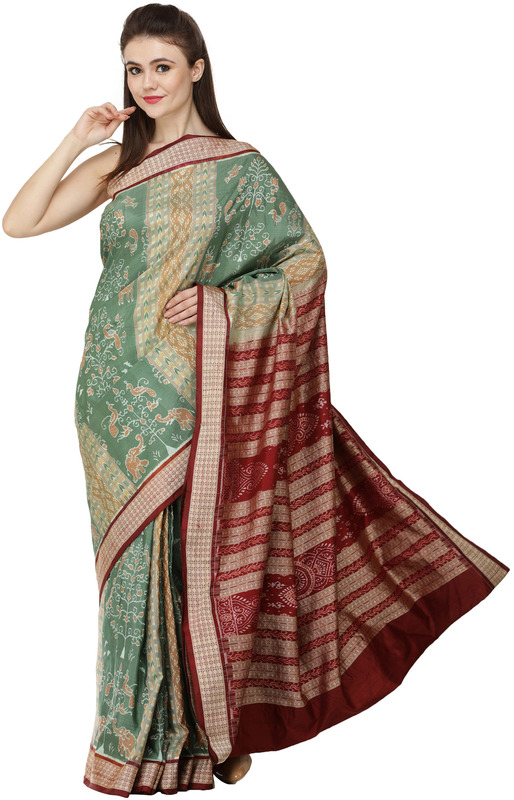 Zoom in on the complex field of this saree to ascertain the beauty of the motifs woven into the fabric. Between thick panels of the highly recognisable ikat weave are motifs of the local fauna. Elephants fiddling with the foliage with their trunks, peacocks perched on the upper reaches. These images have been very precisely and uniformly reproduced all the way till the fall of the saree. Do not miss the exquisite endpiece, and the rangoli-esque motifs on it. They are the inimitable result of the weave in question. While Sambhalpuri sarees are traditionally worn to poojas and other ritual functions, you could wear this one to any evening gala with a traditional spin. Your choicest gold pieces would go well with this one.